To educate and increase the public’s understanding of the environment and its importance by offering courses, seminars, conferences and meetings and by collecting and disseminating information on that topic. When I became aware there was something, an aspect of the unknown inside that could/would surface in a seemingly effortless, subconscious way. With the passing of time and experience, I consider it safe to say I’m now a competent communicator, capable of responding to the moment, even more so as time allows a delay based on time needed to cogitate. Initially, I was in high school, grade 12, back in the late 60’s. My Creative English teacher gave us an assignment to write a short poem and I came up with a stream of conscience ditty that impressed him and the class. For the first time I realized there was something coming out of me that was foreign yet part of me, though not really connected to any real, personal life experience other than as an observer for the most part. Utopian Frontiers is a story about the relationship between humankind and technology. The message is one of hope and well being for the future. For details, please visit http://www.utopianfrontiersfoundation.com/ . What was the inspiration to write the book? Back in the 70’s, I was working as an Employee Relations Supervisor for a mining company located up North near the Alaskan panhandle. It was a hard rock mine operation located in the Coastal Mountain Range system of mountains. The mine site was located up in the mountains, near a huge field of glaciers. A tunnel led from the mill and habitation area, going under 3 mountains and 2 glaciers just to get to the ore body. How does 1000 inches of snow a year sound? Newmont Asarco (an American based transnational mining conglomerate, although the mine was actually located in the province of British Columbia, Canada) had controlling interest of the property, and they had an architect draw up a conceptual design for a dome that would cover the mill and living quarters, making the community an enclosed environment, sort of a city out in the wilderness. Yet even though the rising price of gold and copper residuals made the running of the mine profitable in the late 60’s and early 70’s, expense related to the dome made that investment a no go. We still drank water from glacial fed springs, breathed some of the cleanest air on the planet, witnessed the Northern Lights, and viewed mountains at night that seemed surreal, so clear and stark they were, as if supported by two by fours, a card board cut out of the original we were so blessed to stand in awe of. When I moved back down South I immediately had eye problems related to air pollution but that’s another story. I reconnected with my soon to be writing associate, Mike Parsons, and we picked up on mutual concerns, such as social/political/economic realities of the times. We discussed my experiences in a semi isolated corporate environment, lamented the condition of existing cities and related problems, and began to play “WHAT IF”. See the film tab at the UFF website for a short version of that story. With the passing of Mike, I inherited the task of advancing the cause, and in keeping with the myth (any and all who become involved are encouraged to be themselves and make a creative contribution). I have worked a day job ever since and only now have the opportunity of stepping up to the plate and letting the show take life. So, with the encouragement and suggestions of friends and associates, eventually I contracted with BurmanBooks to publish a book. Sanjay Burman helped bring on a creative writer (Drew Tapley) tasked to convert the screenplay Mike and I had written into an updated version of the story in book form, with myself as Editor of the book. The book Utopian Frontiers will hopefully, in turn, garner interest in making the film that Mike and I thought would best represent a full, dramatic, public exposition of the project, bringing us full circle. Elizabeth (Beth) Sharp: Mother Earth as an educator with attitude. It was a smooth/bumpy/long ride. I certainly would’ve started earlier. The digital and audio versions will be available soon. Getting and maintaining a corporate position for the Utopian Frontiers Foundation which allows me to afford all of these efforts as a personal investment in this project. It’s a creative project I have had on the back burner for a few decades. Intended as a graphic novel, it’s about a character who is born late, and is always late for everything. The puzzle I see as the “human condition” lies scattered in pieces, in need of assembly into a cogent vision, a big picture that makes sense and holds together. Are we too late or are we just in time to save the world for future generations to come? (agree/reject/laugh/frown/whatever/here/please). And if we are truly a responsible species, one that should know better when it comes to common sense, why are we wasting time stalling while so many suffer needlessly? We have the human capital yet our existing systems do not allow us to “invest” wisely, so it seems, and as a consequence, so many lives needlessly go to waste. 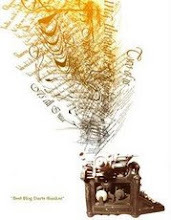 For information about Utopian Frontiers, the book, the organization or the music, visit http://www.utopianfrontiers.com/. 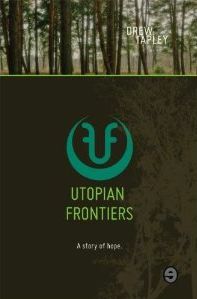 To learn more about the book and to get your copy, visit http://www.amazon.com/Utopian-Frontiers-Story-Drew-Tapley/dp/1927005124/. Chop, Chop, which seems to be geared toward older teens, has been free for the month of February. I downloaded it to my Kindle based upon comments I found. Everyone seemed to love it, and the reviews on Amazon are also positive. BLURB: Greg and Laci make it a regular practice to grow their hair long so that they can chop it off and send it to Locks of Love. It's only one of the things that reserved, young David must tolerate as their friendship grows throughout the years. As they near adulthood the three become closer not only to each other, but to God as well. David finds himself content in every way, but when tragedy strikes, David must struggle to find his way back to God. 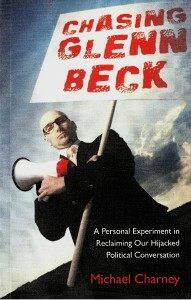 COVER: Perfect based upon Greg's and Laci's practice of growing their hair and then cutting it to send to Locks of Love. I like that it's black and white. Not all the covers for the sequels are, but this first book in the Chop, Chop series and the sixth book, Gone, are designed that way. It's odd, though, that the author's name isn't on the cover. FIRST CHAPTER: I can't share the opening because it would ruin the impact of reading it, but David is the narrator who is telling the story of the summer Greg moved to town. David and Laci have known each other since preschool, and this is the summer before they start seventh grade. David and Laci, along with some of their other friends, end up joining the youth group at church where Greg's father is the youth pastor (I'm guessing, because it doesn't flat out say that). When David tells Greg about Laci's practice of growing her hair and then cutting it and donating it, Greg decides it's a great idea. David, however, who has never been a fan of Laci looking like a boy, is certain he doesn't want to grow his hair. KEEP READING: Yes, but mainly based upon comments about how wonderful this story is and how it garnered an Honorable Mention at the 2008 Blue Ridge Mountains Christian Writers Conference. I loved the opening. It's shocking and it's powerful. David quickly moves us from the present, back to the summer he and his friends met Greg. Laci is very much a part of David's life by the time Greg comes along, and David admits if he's to tell the story he has to start with Laci because it starts and ends with Laci and him. David is an excellent narrator. You get the feeling that he's a good deal older when he tells the story than when the events occurred. There are funny spots, even though he is called grumpy by his friends. And you get the sense that teenage David believes things should be a certain way: girls shouldn't have short hair and look like boys and boys don't grow their hair long either. David is one reason I want to continue reading, but the opening plays a big role too, because you know something bad happened somewhere along the line. I can't say I was totally drawn in by this first chapter, but I'm interested enough to keep going. My only criticism is that there aren't clear chapter markings. There are breaks marked by "~ ~ ~" but if there wasn't so much white space left on the last page of what I would call the first chapter, you wouldn't know. Call me silly, I just like to be sure when a chapter ends. Once you get the zing you can’t go back. I recently spent a week at the beach in California. It wasn't remotely warm, the water downright frigid. But my kids spent hours digging imaginary castles and moats in the sand. I roamed the surf's edge finding sand dollars to collect. The constant rolling of the ocean was such a difference from where we live. Colorado. The tall mountains, rugged snow capped peaks. No salt water in the entire time zone. I love mountain life. The cold, sharp edges in winter, the soft lushness of summer. These two completely different settings can change a story entirely. 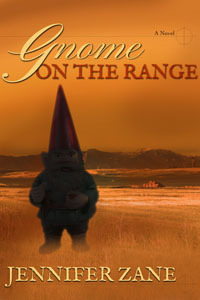 My new book, Gnome On The Range, takes place in a small town in Montana. Mountains. If I had it set in Miami instead (beach), the book would be completely different--and so would the title! Is it sunny, cloudy, foggy, rainy, hot or cold? Is it day, night, crowded, quiet, peaceful, hectic? I made setting in the book even more specific. Summer vs. winter. In Montana, winter is long, summer unbelievably short. Every summer I lived there it snowed June 12th. And it got cold the day after Labor Day. That gave me about eight weeks of guaranteed summer play time. I squeezed every drop of summer fun into that small window. I did the same with my book. My main character, Jane, and her two boys, buy two ceramic garden gnomes at a garage sale. Besides that, they swim, bike, camp, go to the county fair, watch a demolition derby and all the other offerings the Big Sky can provide in July. But someone wants the garden gnomes and will stop at nothing to get them. Including trying to kill Jane. At the county fair. And other summer-y (and surprisingly dangerous) places! Could I have chosen a beach setting? Of course. But Jane, Goldie, Ty and all of the other characters in the story are who they are because of where they live. Rugged, enduring, independent. Just like the mountains that surround their town. I've decided my next book will take place in the dead of winter. It'll be below zero, snowy and dark, and months until any kind of spring thaw. Typical Montana weather--for December. I look forward to writing about the quirks of not only my characters, but the frigid Montana setting as well. And continue to vacation at the beach. Jennifer Zane writes contemporary fiction with lots of humor, some mystery and a dab of romance. Gnome On The Range is her debut novel. Fabian is also willing to speak to book clubs and parishes through telephone or Skype. Photos, interviews, and more information available on request or by visiting http://www.whygodmatters.com/ or http://www.fabianspace.com/. With the death of Whitney Houston so recent, it's not surprising several e-books have popped up this month about the iconic singer. The Life and Death of Whitney Houston by Kim Hudson﻿ offers a glimpse into Houston's life and the days leading up to her death. The book includes photographs and several clickable links to sources. Broken down into sections, this short e-book brings you through her childhood years, her modeling, her years in music and film, and her troubled personal life. It ends with a recap on recent news. Also included are public statements and quotes, and some Houston trivia. In the end, readers learn very little if anything new about Houston's life. The content is compiled from online sources and reads like a school book report. If I hadn't gotten it for free, I wouldn't be happy. I downloaded a free copy of this book for my Kindle. I received no monetary compensation for this review. Hello. My name is Cheryl and I'm a free Kindle download addict. I have over 230 free e-books on my Kindle Fire right now. I've been doing my best to limit the number of books I download, but there are so many that sound good. The nice thing is I can quickly skim a chapter or two and decide if a book is for me. How many free e-books on your device right now? Has access to free e-books changed your book buying habits? Somewhere out there, is someone waiting to share my life? “Somewhere out there,” Lanae Petersen sang. “That’s the snippet I wrote when I journaled this morning.” Her sing-song statement elicited a wide grin from her sister, Geneva Carson. “I’m thankful you found that journal writing such a help while you were sick,” Geneva commented. The little catch phrases or quotes Lanae had latched onto after she found out hepatitis C was the cause of her sickness, were the only things that got her through some days. And reading the Bible, of course. Lanae glanced at the art-glass design of the sun catcher hanging in the window, a gift from Rainn Harris, Geneva’s fiancé. She compared the pattern with the appliqué cross Geneva was now anchoring onto the background fabric of her current wall quilt. “I’m alive. Praise God.” Lanae slapped the newspaper against her lap and waved her open arms toward the ceiling. Geneva shook her head, an indulgent smile spreading across her face. Geneva shared a look that took them back to girlhood. “Do any say if they’re Christian?” Geneva asked around the needle between her lips as she measured a length of thread. “Not yet. Here’s an SWM, Single White Male, looking for smarts. Ohhkaaay. I might give this one an answer. He’s a ranch owner.” Mourning what could have been, Lanae rubbed a spot of newspaper dust off the soft dark leather of her recliner. A life lived out on her own ranch. “Then again, been there, done that, with my rancher.” But he died before the culmination of their life together. Lanae contemplated the word “dream,” sighed over the memory of her deceased husband, and formed a sad smile. The Lord’s timing had no explanation. Their shop, Frivolities, was the widowed sisters’ joint business venture. When she’d seen the ad in their hometown paper listing a downtown building for sale in Platteville, she jumped at the chance to move back to where she’d been born. Geneva called Lanae in response to the same ad. Certainly seemed like God’s prompting. Lanae sighed. Jesus held her future the same as He’d been with her all her life. “And speaking of ads...” she brushed her fingers to the side. “Think I’ll give them a call later,” Lanae said as she once again buried her nose in the paper. Besides the gifts, antiques, and frivolities the shop sold, they had an espresso machine and Lanae’s baked goods. Customers came in and experienced…no, savored, their offerings. It was a God-thing, how the idea for the crazy items—Moselle’s handcrafts, Geneva’s quilts and specialty coffees, and Lanae’s crochet and cheesecakes—had come to them at the same time when they’d each seen the building advertised. With the long state of Nebraska between them, each sister had recognized the opportunity to use her skills for profit. She considered the Frivolities women. At the moment, her niece Moselle—the third party in the Frivolities venture—was on her honeymoon, or she’d be working on a craft designed from old items right along with them. Mondays, when the shop was closed, weren’t always for leisure. It was their practice to meet as part of their business plan and to work on their contributions to keep Frivolities stocked with goodies. The sisters shared a look that covered a myriad of unspoken thoughts. “You could find yourself a man. After all, I found my Rainn. That way your guy could do the reading when your eyes go.” Geneva’s teasing held a dreamy quality. “If my eyes go, I’ll blame it on all that crocheting I did instead of sleeping when I was sick.” Lanae flipped the page to see how many more columns the ads covered. None. The singles were confined to one page. She studied her sister. Geneva looked so pretty in love. She could almost pass for her daughter, Moselle. “That sounds interesting. You mean he moved in when I moved out of your house?” Lanae snorted. “That girl. Remember how she spelled out her name and pronounced it ‘M-E-ah,’ so we’d all get it right?” They shared reminiscent smiles. Mia’s mother, Rainn’s sister, was a single mom who died of drug-related, mysterious circumstances in Fort Worth, Texas. Rainn’s parents wanted no part of caring for a child with special needs; so Rainn became custodial caregiver of his six-year-old niece, a special child with autism. Lanae shook her head and shot another smile at Geneva. She was still trying to wrap her mind around the vast changes in their family over the last few months. First, her niece, Moselle, had reunited with her high school love, Eric, and married him seventy-two hours ago, the day after Thanksgiving. Second, Geneva had blossomed every day because of the attention Rainn Harris, Eric’s firefighter buddy, paid her. He’d rescued her from a tree, where she’d climbed after a stray cat. The family still made jokes about it, how she’d fallen into his arms when he rescued her. “If that doesn’t sound like you, I’ll eat my needle,” Geneva mumbled around that sharp object. “Don’t laugh, or you just might,” Lanae said. Then she laughed loud enough for both of them. This particular Monday morning’s working session and business meeting had fizzled. Wedding and holiday still filled the atmosphere, so Geneva and Lanae had made short business of their shop-talk duties. They now attended to the creative side of their joint venture, working on individual quilted fabric and crochet items. Well, Lanae had attempted to work. She’d eventually set aside her crochet hook and picked up the newspaper. The women closest to Lanae, sister and niece, faced the future with their respective firefighters. The men had their softer sides. Eric sold insurance and built birdhouses for fun. Rainn was a stained glass artist and would soon start teaching at community college. Dare Lanae follow through with her planned man hunt? She had been content with her life. She hadn’t faced the loneliness, or missed having a man around, until she witnessed what love did for the two women she loved. She missed the poignancy of love, how much brighter and happier life could be when shared with the right person. But she was a different person now, living in a different time and place. Maybe God had a new plan for her. But if this was it, she would be happy as long as she followed God’s will. The memory of hair loss sobered Lanae. Her Hep C meds hadn’t caused her to lose hers like some cancer treatments did, but her hair sure had thinned. She’d decided to keep her hair short. Joy and peace now flushed her soul. She ran her fingertips over the leather chair that offered comfort every time the deep cushions welcomed her. Family and friends had taken up a collection for the recliner, and a grand gift it was. She’d been so overwhelmed with their outpouring of love. But was the love of God, family, and friends enough for fulfilling relationships? Or was she meant to find a special someone to spend the rest of her days with? Lanae’s gaze traced the blocks in the quilt Geneva had made, which now graced the wall. Arranged in varied blocks of crosses, surrounding one huge cross in front of a blazing gold light, the teal and mauve colors never failed to warm her heart. The thick quilt had warded off the chill on her legs, originally serving the purpose of lap blanket. Should she be looking for someone? Or should she leave it to God to bring that special someone to her? Or, should she, like the biblical Paul, be content with what she had? Lanae played with the strap of the denim bag Moselle had designed. The tote was created from a pair of old jeans. Lanae tucked away her balls of yarn and current crochet project into the bag. “I would imagine Moselle and Eric are having a great time about now.” Geneva spoke on a wistful sigh as though wishing she was on her own honeymoon. The sisters exchanged understanding smiles. Lanae’s turned into laughter then higher pitched giggles as Geneva’s color rose to a deep blush. Lanae set her tote on a nearby shelf and straightened her journal and daily devotional on the cabinet top. She folded the newspaper in her lap and took in her immediate surroundings. Eric, her new nephew by marriage, had built the cabinet next to her recliner. Handcrafted in golden oak, the cabinet itself consisted of two shelves and a routed edged top. The stained-glass sun catcher caught her eye again and she said a prayer of thankfulness for Rainn, her soon-to-be brother-in-law. Sections of amber and pink glass in the shape of a rose formed the backdrop for the amber cross. Humbled anew at their gifts of love, she realized yet again how blessed she was to have so many loved ones in her life. Yet, no special man filled the role of lover. “A young guy wants an older woman?” Geneva quipped. “In your dreams,” they chorused, caught the other’s eye, and giggled. “Your dream came true,” Lanae sassed. “No such thing as luck,” they joined voices again; same slight nuance in tone, same inflection, same identical timing. The sisters shared familial comfort and continued with their individual tasks. "I absolutely loved this one. It kept me riveted to my kindle from the get go. The third in the Frivolities series, LoRee Peery has woven an amazing tale of love the second time around. Lanae is determined to live life to the full and has thrown herself into the shop she owns with her sister and niece, yet she yearns for the love they’ve found, the kind she used to know with her husband before his death. Answer an ad in the paper and buying a vanity unit from cowboy Sage offers her that. Or does it? Sage is still mourning his wife, several years after her death. Living in the past to protect his family from the sordid truth, he doesn’t want Lanae’s interference in raking over the coals of the skeletons in the closet. Woven into this is the love story of the letters. Lives torn apart by a series of actions beyond anyone’s control. With it’s amazing characters, setting so real I could see it unfold in my head like a movie, this one has definitely gone back into my TBR pile. A heart-warming story of love, loss and hope you don’t want to miss." PURCHASE AT PELICAN BOOK GROUP! LoRee Peery writes Christian romance, where characters learn through spiritual struggles how to come to terms with the Lord’s will. She is a country girl who attempts to see God’s presence every day. That glimpse often comes as a gift from nature. LoRee is most relaxed in the outdoors. Selwyn Mills served an apprenticeship in decorative painting before starting his own business in 1956, which lasted until his retirement in 1992. He worked as a craftsman painter, wrote for the National Paint Journal, served as President of the National Painting Contractor Association in Nassau County, New York, and taught faux painting. While painting professionally, Mills earned his doctorate in psychology and operated a successful private psychotherapy practice. Dr. Mills practiced psychotherapy in Great Neck N.Y. for twenty-five year, specializing in couples therapy, family reconciliation and Men in Transition groups. His psychotherapy practice overlapped his forty year career as a decorative painting contractor. He painted in the mornings and counseled patients in the afternoon and evenings. His research into the left/right brain phenomenon, and its impact of personality development, led to a unique discovery of why opposites attract. Active in live theater, he wrote and produced a musical comedy called, “Love Torment and Lollipops”. An accomplished photographer, his black and white prints are part of the permanent collection of the Bibliotech Nationale in Paris, France. He currently works at the Sugden Theater in Naples, Florida as director of faux painting. Mills married in 1949 at the age of 19 and has four children and four grandchildren. You can visit his website at http://www.selwynmills.com/. I am an 82-year-old retired painting contractor and psychotherapist from Great Neck N.Y. Now living in Naples, Florida, I volunteer my faux painting skills to decorating the sets of the Naples Players Community theater two days a week. I am single and have many friends and four grown children and four grandchildren. They all live in different parts of the country and so I see them less than I like. I read a lot, write a lot am still curious about life. In Brooklyn N.Y. Later moved to L.I., then to Naples, Florida. When I learned to type at 17.…I could not write by hand. (see Necessary Secrets part one). This collection of writings offers an account of my life as well as my ruminations on professional painting, psychotherapy, dyslexia, friendship, romantic love, faux painting, beauty and plastic surgery, poetry, the Naples court and jail system, philosophy, cats, other topics. I spent most of my professional life between two concurrent careers. I worked as a decorative painting contractor in the mornings and had a private practice in psychotherapy in the afternoons and evenings. The subtitle of the book is Revealing Necessary Secrets I always wanted to reveal my color-blindness and dyslexia but was fearful of the consequences…loss of professional credibility, respect for my intelligence. My friends and my nephew Bruce. NO….I wish I could afford one. I would have hired a better proof reader. At my website http://www.selwynmills.com/ and Amazon.com. Don’t expect to get rich. Write from the heart. Another book I can believe in. Don’t have it yet. Observe life, make good choices. A funny and inspiring book that blends personal stories and advice with a love of chocolate to help you manage the obstacles along the "rocky road of life." In The Chocolate Diaries, Karen Scalf Linamen shares stories from her life and those of other women, to bring you a helpful book on surviving the trials and tribulations of daily life. From broken relationships to deaths, and from the challenges of raising children to the difficulties of picking up your life and starting all over again, Linamen sprinkles these uplifting stories with a dose of humor and lots of chocolate. As I mentioned in my First Chapter Review of this book on Monday, the author wastes no time in setting up her theme: misery and chocolate. She opens in the kitchen and food plays a part throughout the book. While the chapters and stories might change, you can be sure of three things: 1) the question, "What's your secret to a sweeter journey on the rocky road of life?" will be asked during each chapter and be answered by a different individual; 2) there is a Food for Thought section toward the end of each chapter that allows the reader to reflect on what she has read and how it applies to her life; and 3) each chapter ends with a quick and easy recipe. As Linamen states within the book, misery and food--namely chocolate--have a long history, so it makes sense to blend them together. This faith-based inspirational read will help you smile. It will probably even make you chuckle. Most importantly, it will help you devise a plan for surviving and thriving despite the bumps in the road. I received a free e-copy of this book from the publisher in exchange for my honest opinions. I received no monetary compensation of any kind for this review. While I usually reserve YA titles for my children's and teens' book blog, since I am performing a First Chapter Review, I will post it here. BLURB: Stephen Wilson, a 17-year-old arrives at Minneapolis in search of a better education. However, he ends up getting more than he could dream of. Lisa Morgan, a gorgeous girl who happens to offer similar subjects with young Stephen. Her beauty, like a stirring fragrance that draws every male towards her – including Stephen. These two meet in an incident that not only changes their life but releases to them a whole new world. 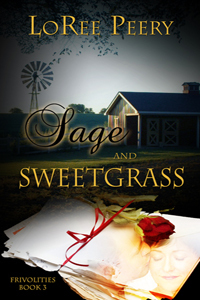 Follow Stephen and Lisa as they travel through a world where romance and mystery intertwine. COVER: This book is young adult fantasy, but the cover seems to focus more on the romance aspect than fantasy. Perhaps it would make sense if I had read further into the book, but if I were a fantasy lover using only the cover to judge if I made a purchase, I would probably pass this one by. I like, however, the font that was used for the title. FIRST CHAPTER: Stephen Wilson arrives in Minneapolis via plane. Though he's visited before, this is the first time he'll be staying for a while. He even has a new house--his house. With the help of his cousin Stacy, he gets acclimated at school. His world quickly turns upside down when he meets Lisa Morgan. KEEP READING: I hate to say this about a book I've had for quite some time, but I could barely make it through the first chapter. Between the grammar and how much information is jammed into this opening, I had to control myself to keep from skipping portions of it. There is a good deal of telling in this chapter, so I couldn't get into Stephen's head very well. I wonder if slowing the pace of the first chapter might have helped a bit. There's a lot going on and you meet several people. I honestly have no idea where the book is going. I received a free e-copy from the author in exchange for my honest opinion. I received no monetary compensation for this review. This book is one of the few that doesn't come from my free Kindle e-book collection. I requested this book for review from Blogging for Books through WaterBrook Multnomah. As is sometimes the case, I requested a few too many books to review last year and now I am scrambling to catch up. BLURB: Karen Linamen dishes up a satisfying blend of moxie and mocha, sharing stories from dozens of women who reveal savvy strategies for embracing a sweeter life—even while traveling rocky roads. If you’re hungry for more joy, reasons to laugh again, ideas to help you heal, and reliable hope leading to a sweeter future, this journey will leave you satisfied. Funny, transparent, and uplifting, The Chocolate Diaries is like taking a road trip with good friends who are wise about life. And while you’re at it, indulge (just a little) in the quirky recipes for concocting chocolate delights out of whatever ingredients you can round up in your kitchen. The road may still be bumpy, but you’ll be having too much fun to care. COVER: Although it's a bit too purple for my tastes, it definitely captures the essence of the book. The diary page directly relates to the title, as does the sweet that is pictured next to the brown drizzled title. 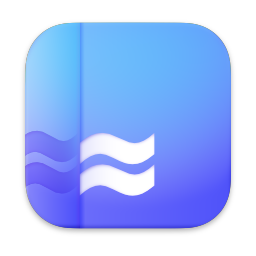 Simple, but nice. FIRST CHAPTER: The narrative opens with the author finding her fifteen-year-old daughter cooking in the kitchen at 3 a.m. because she couldn't sleep. In love with Italian cooking, Kacie also wants to marry Robert, the nephew of Buddy Valastro from Cake Boss. The author quickly moves from Kacie to how watching the Food Network has a show that best represents her life. The show is called Chopped. In between this moving narrative is a question, "What's your secret to a sweeter journey on the rocky road of life?" This is answered by another person who the author has posed this question to--in Chapter One that person is Cindi Chase Joseph from California. The narrative continues and then ends with a "Food for Thought" section that asks questions of the reader, followed by the "Because Real Women Don't Need A Cookbook" section that includes a recipe. KEEP READING! Confession time. I'm on Chapter 8. What I like about this opening chapter is that the author wastes no time in getting to her theme: food and those big and little obstacles we all face in life. As I already know from reading ahead, her daughters play a significant role in this book, so that it opens with Kacie is not a surprise. I liked that aspect anyway, because so much of a mom's life is her children, it made sense. The format of The Chocolate Diaries is also great because it provides the reader other people's perspectives on how to handle the challenges they face, while giving them time to reflect at the end of each chapter, and the reward of a quick and easy recipe. I received a free e-copy of this book in exchange for my honest opinions. A full review will follow shortly. I received no monetary compensation for my review. 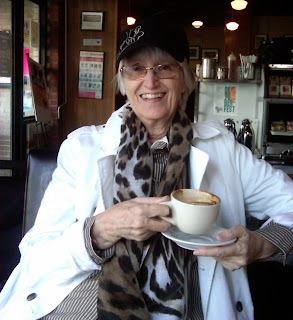 I was contacted by a friend's mother, when she heard I had been self-publishing my books. Here is my response and the main point is that there are lots of people who have done it, and most of us, are willing to help. Also, it isn't as scary as one might think. I do remember you. I would be delighted to tell you all about publishing and help you get your work up on Kindle. It is getting late now, so I will call you tomorrow. Until then, let me mention a few things I've learned. Building up an audience is a slow process. That is okay, though, as the more readers one finds, the more they tell people. I mean, that is how you found me, because of your daughter. Living in the Social Media Age has provided an opportunity for all. It doesn't mean that everyone will be successful. It just means that everyone is given a shot. Those who work hard and write well will have a greater chance than those who talk about writing, and then when they do write, do it poorly. T.S. Elliot once mused, "Some editors are failed writers, but so are most writers." Writing is a joy, but that joy pales in comparison to having one's writing read. I've seen it written that it takes 10 years to become an "Overnight" success as a writer. I don't know if this is true or not, but I've been writing for just over two years, completed three novels and one non-fiction book. I'm hardly a success, yet, but I am getting sales every single day. To me, that is some measure of success. One month ago, I was getting a sale or two per week. In a year, who knows. The point is that I will keep writing, continue to self-publish, and I will make sure to build my audience every day, as best I can. As for the publishing end, I have this to say. Most people who want to self-publish and don't are simply unable to comprehend what is involved, not that it is difficult, but that it is so foreign. If one buys a new piece of software and installs it on their computer, they will find that <ctrl> c and <ctrl> v are used for copy and paste, because it is universal. They are familiar with which buttons to choose to make it do what they want, but publishing is unlike anything tried before, there isn't a familiarity that helps one get over the fear. That is why it is nice to have someone who will answer your questions. I didn't have anyone, but that was okay, as I am naturally predisposed to figuring stuff out on my own. I have learned what to do and I'll be glad to share it. Brian Meeks is the author of the Henry Wood Detective series and the recently released, Two Decades and Counting: The Wins, The Streak, The Hawkeyes Thru the Eyes of Roy Marble. 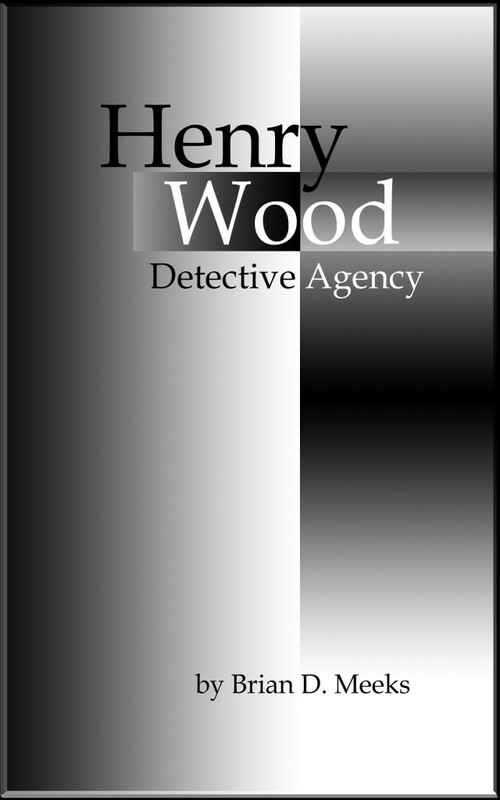 He had a publisher for the 1st book in the Henry Wood series, but decided to self-publish the Roy Mable book, as he was interested in learning what was involved. 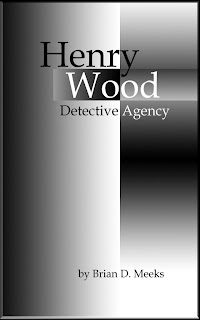 He found it enjoyable and the success of the launch has changed his plans for the upcoming release of the second and third books in the Henry Wood series. With the exception of Two Decades, he has written all of his novels as serials on his blog, http://extremelyaverage.com and they can be found there, warts and all. Brian hires an editor before publishing and goes to great lengths to produce a quality product, but he doesn't mind people seeing how he writes during the initial draft. "It is motivating to write as a serial and I don't want to let anything get in the way of telling the story." I've been trying to post one of these all week, but the stomach bug arrived at our house Sunday night and I am teaching a workshop too. BLURB: Charlie Parker's romantic honeymoon in Taos, New Mexico, is interrupted when a ski instructor who works for her husband is fingered for the murder of his priestly brother, and a cache of priceless artifacts turns up in her ski chalet. COVER: While I have to admit, this is not my favorite cover, I like that the author has been consistent since the first book's release. Each book is designed the same way: one color background, the title bordered off with a contrasting color, the author's name in bold at the top, and an eye hole with a picture in the middle--though this cover's appears to be less oval than the others. The hearts make you think love and honeymoons, so it works. FIRST CHAPTER: We open with Charlie and her new husband Drake in what appears to be a spot of trouble. Drake is a pilot and Charlie is preparing for her license. In addition, Charlie is part owner of RJP Investigations with her brother, Ron. With their house being renovated, Charlie and Drake are living in the RJP offices. Because of their rush wedding, they never went on a honeymoon, so they are eager to accept a friend's offer to visit Taos and provide heli-skiing tours around the holidays. KEEP READING: You betcha! In case I've never mentioned it before, I like action to start off my books. It's part of why I am drawn so much to mysteries--usually a dead body turns up or someone's life is in danger within the first few paragraphs. This is the sixth book in the Charlie Parker Mystery Series, but it's the first one I've read, so that added a sense of mystery to the opening. I honestly wasn't sure what was going on. Shelton smartly didn't pull me around on a string for too long, knowing I might get ticked off. Once aware of what was happening, I was able to digest a bit of back story and then be thrilled with the cliffhanger end of this short chapter. I'm eager to find out what happens next. I live in Honolulu, but I was born in Hackensack, grew up outside Chicago, lived in L.A. and Boston, went to school in Iowa and Seattle, worked in Borneo, vacation in Washington DC, and some of my family live in London. So I guess I’m from all over. I worked in advertising for a number of years and have written ads for every kind of media and for every kind of client imaginable. (I actually wrote a bar once. It was a history of Waikiki on placemats, which were immortalized under Plexiglas so drinkers could ponder them over their third mai tai.) 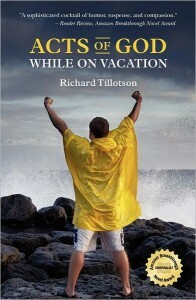 Before ACTS OF GOD WHILE ON VACATION was published, most of my own creative writing had been plays and screenplays. I’ve had a play produced Off-Broadway in New York. I decided I wanted to be a writer when I was around seven and wrote a (very) short story about a turkey. I didn’t confess my ambition to anyone until I got to college where, in my senior year, I won a (longer) short story contest with a tale about fruit pickers in California. After that, the die was cast. I try to keep to a routine. It used to be I’d wake up at 4:30 am and put in a couple of hours before heading to the office. Now I can do my writing after breakfast and in daylight. Feels like quite a luxury. It begins with a death threat received by a philandering general manager of a lavish Hawaii resort, jumps to an anthropologist researching headhunters in the jungles of Borneo, then to a demonic, scandal-mongering paparazzo in New York, and on to a gorgeous, party-loving English aristocrat in London. Alternately desperate and hilarious adventures draw them all to Waikiki, where their arrival coincides with an international conference on shamanism and a catastrophic, force-five hurricane. We had a relatively minor hurricane, hurricane Iwa, come through Honolulu a number of years ago. When you know a hurricane’s coming, after you’ve taped all the windows, pulled together the bottled water and flashlights, and figured out how to fit everybody into the bathtub, there’s not much to do but sit around and wait. I was doing a lot of hotel advertising at the time, and as I was sitting around waiting, I got to thinking about what must be going on in Waikiki. I’m very eclectic. I still enjoy browsing bookstores and library shelves, pulling down a book that looks interesting, and I’ll wind up reading it for the very reason that I haven’t read anything like it before. I enjoy contemporary comic novels (I wrote one, after all), but I also greatly enjoy authors like Jane Austen, Joseph Conrad, Charles Dickens, and – moving over to our continent, Herman Melville, Nathaniel Hawthorne, Mark Twain, and – moving back to the UK of the present day – David Lodge, Michael Frayn, David Mitchell, and – moving back over here – Alan Furst, Tom Wolfe… You get the idea. Those are the writers who float through my top of mind at the moment. I also enjoy reading THE NEW YORKER every week, and I’ve got a complete collection of all the Rex Stout Nero Wolfe novels. I had a very good agent, a former editor of the New York Times Review of Books. 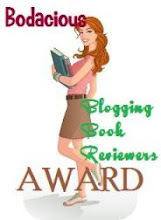 He suggested I send the book to the Amazon Breakthrough Novel Award competition. When it achieved semi-finalist status out of several thousand entries and got a highly positive review from PUBLISHERS WEEKLY, we assumed acceptance by major publisher would be a slam-dunk. But that was in 2009 when the publishing industry was falling off a cliff along with the rest of the economy, and publishers were disinclined to take risks with debut novelists. 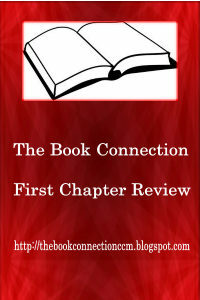 Eventually I decided to self-publish through Createspace, which is an Amazon company. I’ve been delighted with how well it’s gone and count myself very fortunate. The publishing world has changed dramatically just since 2009, and I expect by the time I finish this next novel, it will have changed dramatically again. Whatever publishing looks like, the really important things remain the same. First off, you have to write a good book. It is in most bookstores in Hawaii. On the continent, it’s easiest to get it through Amazon where it is available in both print and Kindle editions. The book can also be ordered by any local bookstore through their usual wholesalers like Ingrams. I don’t blog, tweet, or have a website, so I used to think that cyber-wise, I’d be doomed. To my surprise, however, the other day I typed the full title of my novel, ACTS OF GOD WHILE ON VACATION, into Google and at least two or three pages of links came up. A number of these links are to reviews of the book that have appeared in Hawaii. Since I live here, the reviews also have some information about me. I’m happy for anyone to read any of these reviews, because so far, they’ve all been very positive. They’re also quoted on the book’s Amazon page. We’re working on one that is based on an interview I had with Hawaii Public Radio. When it gets done, we’ll put it up on the book’s Amazon page and the Amazon Author’s page. I believe the best advice I ever got was in the book THE ART OF FICTION by David Lodge. I recommend it to everyone. I’m a third of the way through a second novel, but it is temporarily on the shelf while I rewrite a screenplay that has interested some people in Los Angeles. I’m also in the process of submitting a new play and a musical to a couple of theaters. Kill or be killed. Patience County's Sheriff, Sam Trunce is in the cross hairs of a Mexican drug cartel. He is not alone. Patience County's secret army of combat vets, Masai warriors and history's most deadly female assassin stand at his side. The Cartel's murder squad and Patience's army hurtle towards war, winner takes all. "Patience County War is a hoot. From the minute I picked it up I couldn't stop reading. It's set in the Southern back-woods with a group of characters you'll want to spend more time with. It's a great read for a rainy (or snowy) afternoon." A uniquely set literary mystery awaits you in A Place to Die by Dorothy James. Eleanor and Franz Fabian travel from New York to the Vienna Woods to spend time with Franz's mother at the retirement home. While visiting on Boxing Day, they hear of the tragic death of Herr Hans Graf, a popular resident of Haus im Wald. They soon find themselves thrust into the middle of a homicide investigation. 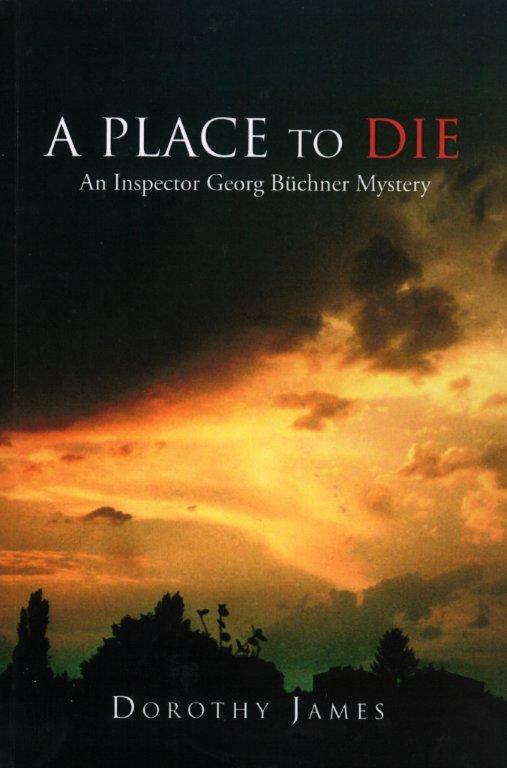 Inspector Georg Büchner discovers surprising connections between Herr Graf and many of the residents and staff of Haus im Wald, and reunites with a former comrade who has surprisingly turned to a religious order. Are his past and the murder related? When I was first asked to review A Place to Die, I was immediately drawn to its unique setting. James immerses the reader in details that make you feel like you are traveling right along with Büchner as he works to solve the crime. This is not your typical mystery novel. It's literary in nature, so the story develops more slowly, each chapter is opened with an introduction, and the pace is much more leisurely than one would expect from a murder mystery. One is rewarded, however, with getting to know the characters well. There are several, many of them quirky, which made the story even more interesting. 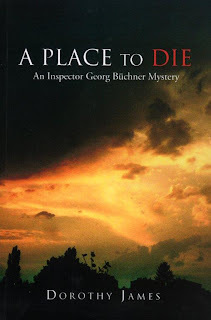 A Place to Die is titled as "An Inspector Georg Büchner Mystery," but since Büchner shares so much of the spotlight with the Fabians it didn't feel that way. Eleanor plays amateur sleuth throughout the book. It seems like James combined elements of a detective novel with that of a cozy mystery. The story unfolds through the points of view of Büchner and the Fabians, which allowed for more information to be shared than if the author had relied on Büchner's sole point of view, but it's like Eleanor takes over. Now, she's crucial to the plot: not only is she the daughter-in-law of one of the residents--which is why she is at Haus im Wald in the first place--but she reconnects with one of her friends who is also a resident. I felt her role as amateur sleuth, however, was distracting to the reader, and shifted the focus away from Büchner. For the most part I was satisfied with how the story concluded, but there were a couple of things left unresolved. Perhaps the reader is supposed to draw her own conclusions based upon what was or wasn't revealed, but in my opinion there shouldn't be any questions after you turn the last page. If you're into literary stories and enjoy mysteries, you might want to give this one a try. It has received several 5-star reviews on Amazon. Dorothy James was born in Wales and grew up in the South Wales Valleys. Writer, editor, and translator, she has published short stories as well as books and articles on German and Austrian literature. She has taught at universities in the U.S., England, and Germany, makes her home now in Brooklyn and often spends time in Vienna and Berlin. She wrote A Place to Die in her attic apartment on the edge of the Vienna Woods. She has travelled far from Wales, but has not lost the Welsh love of playing with language; she writes poems for pleasure as does Chief Inspector Büchner, the whimsical Viennese detective who unravels the first mystery in this new series of novels. I received a free e-copy of this book from the author's publicist in exchange for my honest opinions. I received no monetary compensation for my review. An avid student of the Word, Edward Mrkvicka addresses the fact that adultery is one of the main contributors to the destruction of the American family. Mrkvicka posits that few who engage in adulterous relationships realize the enormity of the cost of infidelity, both to themselves and innocent people in their lives. Beginning by comparing God’s view of adultery to society’s view, No Innocent Affair explains in frank yet loving terms that unrepentant adultery is more than just an innocent affair. It is choosing Satan over Jesus and death over life. 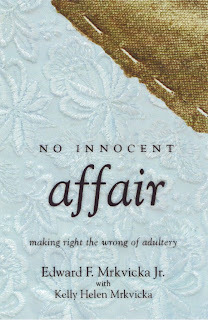 Most important, No Innocent Affair takes you on a step-by-step biblical progression that leads to the sin of adultery being forgiven and salvation reclaimed. Why Adulterers Cheat – How to Cure the Incurrable by Edward Mrkvicka Jr.
1. Takes advantage of others to achieve their own goals: Adultery takes advantage of and hurts innocent spouses and children and is indulged solely for personal gratification. 2. Is preoccupied with fantasies of ideal love: Adulterers, having made the fatal decision to betray their family, can literally think of nothing except their new “soul mate.” Once that relationship collapses, which it almost always does, they go from one adultery to the next, never finding the true love they say they so desperately seek. 3. Requires constant attention: Adulterers are high-maintenance people. As they put themselves first in all things, they find it hard to believe that others don’t have the same reverence to what they perceive to be the natural order of things. 4. Disregards the feelings of others: One woman told me, when questioned about her numerous adulteries, that she had a right to be happy. It never occurred to her and others like her, that in any decent society, no one has a right to be happy at the expense of others. 5. Lacks empathy: There is probably no single emotion more devastating than betrayal, especially when we are betrayed by the person with whom we shared deep personal intimacies, and who promised to be faithful until death. But an adulterer never thinks of the consequences to others. Simply put, they just don’t care, as all their emotions are directed inward. 6. Pursues mainly selfish goals: Adultery is nothing if not pure selfishness. It is the worship of self to a degree that it is unfathomable to most of us. As a society, we’ve tried everything to make adultery acceptable and hip, but that doesn’t change the truth -- even the adulterer knows what they are doing is wrong, which is why they lie to cover their tracks. Narcissists, blinded by their selfishness, commit adultery without being able to see the danger. When they finally come to understand they’ve taken a wrong turn in their lives, usually after they are caught, they invariably turn to the medical profession (psychiatry) that quietly admits that there is little it can do, as there is no cure for narcissism. The good news is, it is impossible to be a narcissist and a practicing Christian at the same time. They are mutually exclusive. Psychiatrists and psychologists cannot cure our choice to be selfish at the expense of others, but God can and will. Edward Mrkvicka is a lay minister and counselor, life-long Bible student, and award-winning Christian author. His efforts on behalf of families, understanding adultery, and the devastating effect of divorce on children have earned him a United States Certificate of Special Congressional Recognition “in recognition of outstanding and invaluable service to the community.” His most recent book, No Innocent Affair: Making Right the Wrong of Adultery, is available at bookstores and Amazon.com. You can visit Edward’s web site at http://www.edwardfmrkvickajr.com/ and find him at Facebook here.